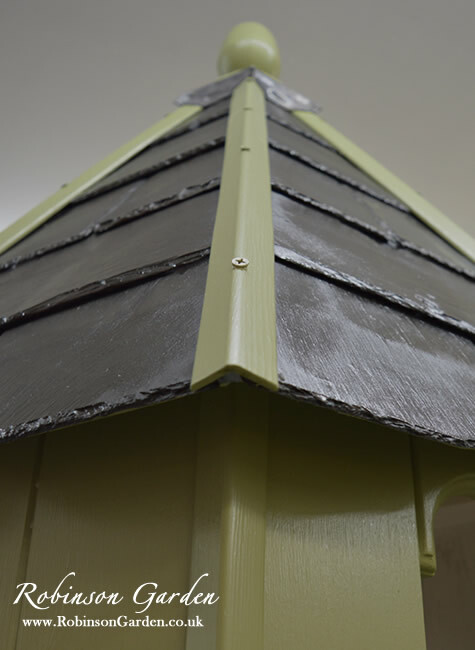 A beautiful and bespoke wooden Dovecote finished with a reclaimed Welsh slate roof with slate roof ridges and a finial of your choice. Hand crafted in our workshop in Lincolnshire, England using the highest quality materials. 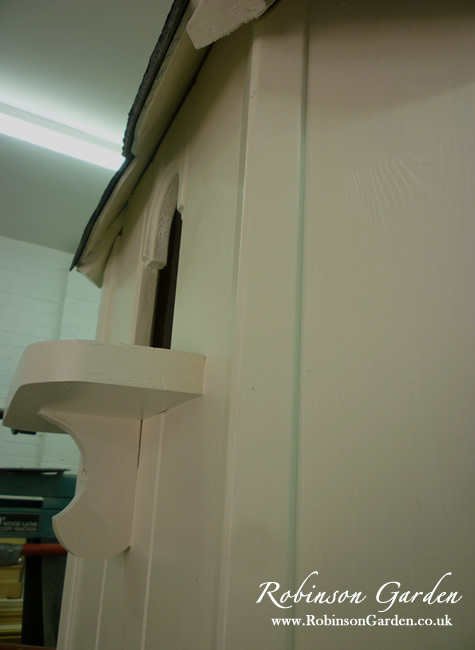 All hand painted in a wide range of Exterior eggshell Farrow & Ball colours. This beautiful wooden Dovecote is suitable to house six pairs of Doves, each pair accommodated in separate compartments. 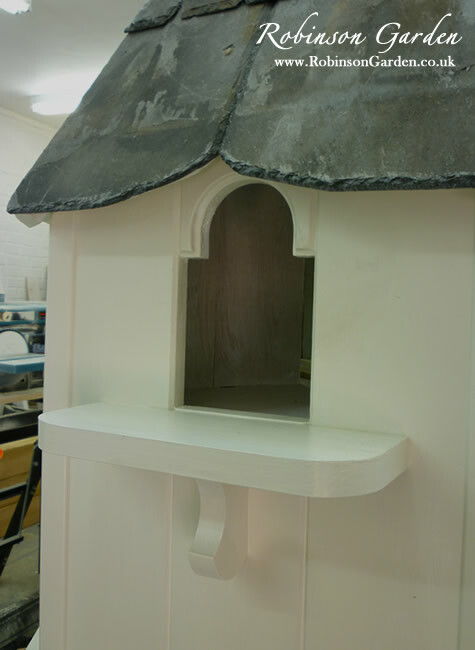 A choice of a Freestanding or a Ground fixed Dovecote. The perfect addition or centerpiece feature to any garden allowing six pairs of Doves to be comfortably homed. 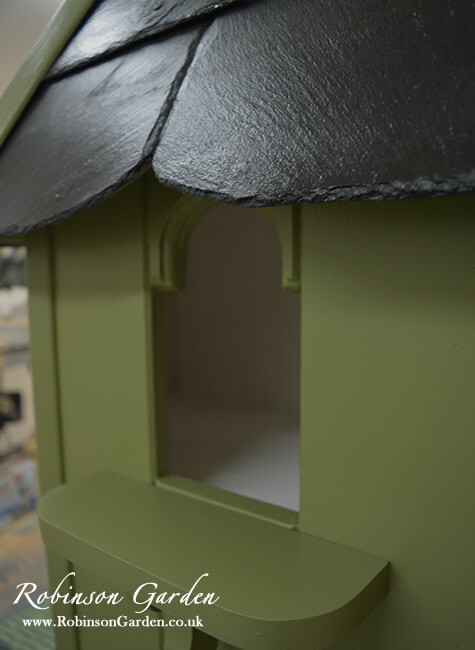 Each Dovecote comes complete with separated living compartments for each pair of Doves including individual landing balconies. Available in either ground fixed or freestanding options. 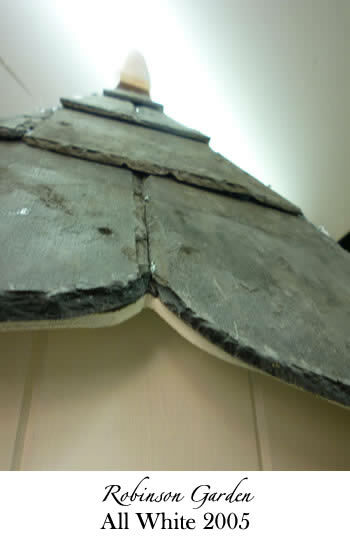 Hand dressed lead crown on each Dovecote roof. Wooden post / pole mounted, suitable for any garden size including smaller suburban gardens. 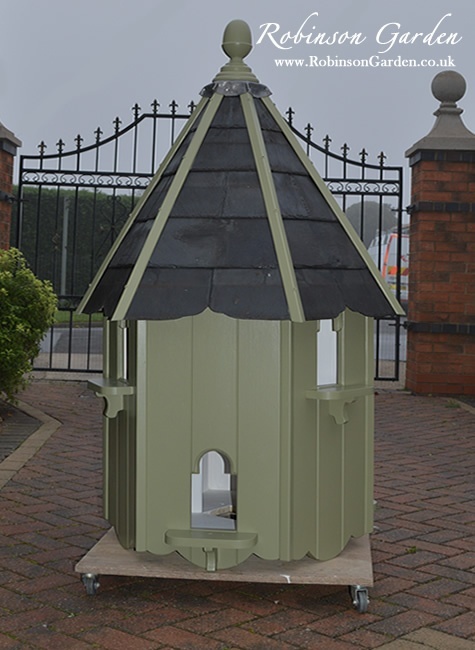 All of our Dovecotes come either ground fixed or free standing allowing you to choose if you would like your Dovecote fixed in a particular location or have it free standing so it can be moved as and when required. 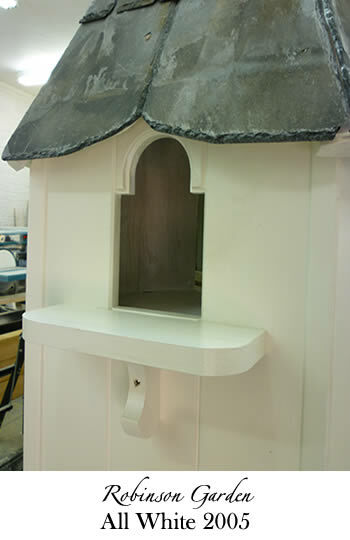 The Freestanding Dovecote allows you to be able to move the Dovecote as and where you wish. We would recommend that it should be moved by at least two people. We do advice that you secure it down in case of adverse weather conditions. Please ensure that the location of where you would like the Dovecote to be ground fixed is suitable for digging into the ground as on average you will need a depth of around 3ft to securely fix the Dovecote into the ground. 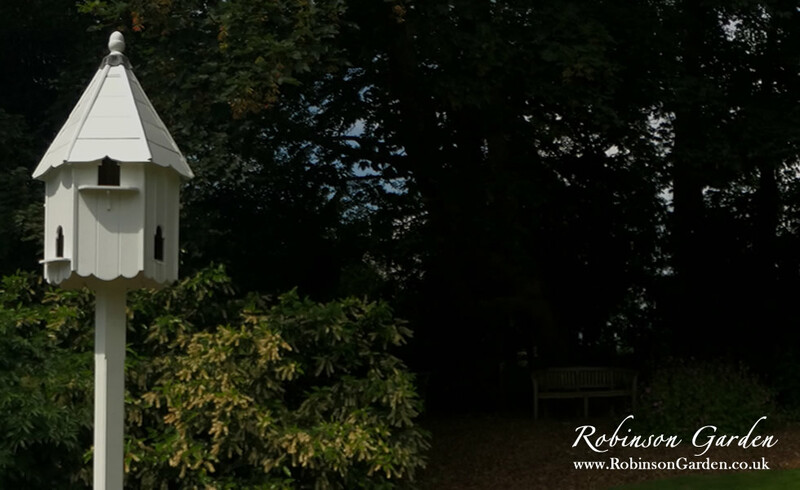 Please read the Robinson Garden Dovecote Guide which provides all the information on how to fit your Ground fixed Dovecote. 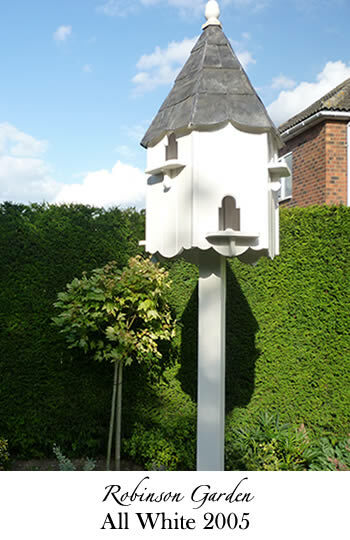 For your safety ensure there is a minimum of 2 people at all times when fitting the Dovecote. 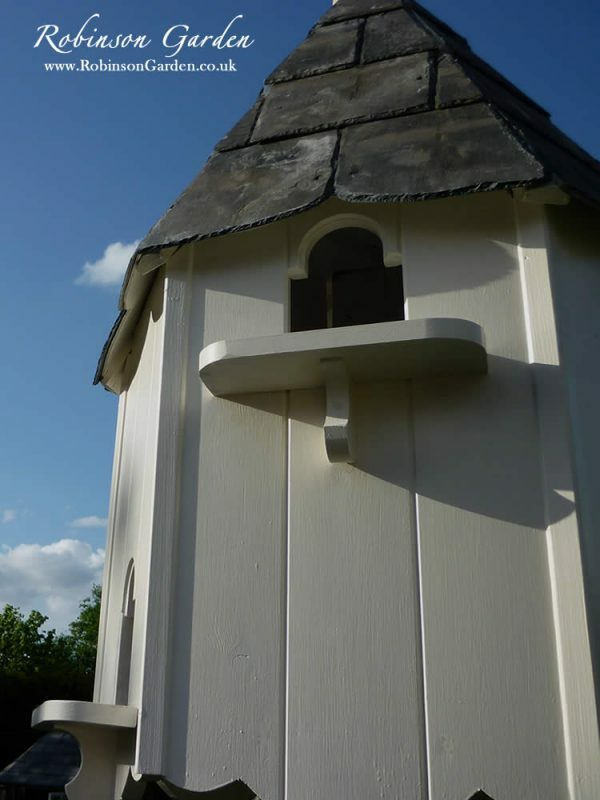 All of our Dovecotes have 6 handcrafted nest boxes, a perfect home for 6 nesting pairs of doves. Each nest box is uniquely independent from the other, reducing the risk of the birds fighting. The nest boxes are just the right sizes for your Doves to build a nest without being too airy or spacious. The nest boxes are equally designed to shelter the Doves from the wind and rain too. In addition to this, the nest boxes have a unique annexed nest area hidden around the corner from the door. It’s important that Doves have their own space and to ensure that, each nest box has it’s own Balcony. The balcony allows the Doves to sit, take off and land. You would find that if the balconies were joined together then the Doves would walk around from one balcony to another increasing the risk of fighting. Robinson, garden, robinson garden, dovecote, dove cote, dovecotes, dove cotes, dovecote park, dovecot, dovecotes, dovecote farm, the dovecote, dovecote Bristol, dovecote for sale, dovecotes for sale, the dovecote Bristol, dovecote minster lovell, dovecote pub Bristol, the dovecote minster lovell, dovecote restaurant, how to make a dovecote, dovecote long ashton, dovecote Lincoln, dovecote fire, what is a dovecote, how to build a dovecote, dovecote swinderby, the dovecote Lincoln, dovecote cottage, marks dovecotes, dovecote hotel Glasgow, dovecots, dovecote house, dovecotes for sale uk, dovecote birdhouse, dovecote bristol fire, cheap dovecotes for sale, dovecotes uk, 4 diy dovecote designs, dovecote design, wall mounted dovecote, the dovecote restaurant, dovecote definition, build a dovecote, making a dovecote, the dovecot, dovecote hotel, dovecote designs, dovecote for sale uk, dovecote cottage Grasmere, dovecote restaurant minster lovell, building a dovecote, dovecote bird houses, small dovecote, wall mounted dovecotes for sale, diy dovecote, the dovecote minster, wooden dovecote, buy dovecote, dovecote bird table, build your own dovecote, dovecote décor, dovecotes design, garden dovecotes, dovecote records, english dovecote birdhouse, pictures of dovecotes, dovecot cottage, dovecote uk, make a dovecote, the dovecotes, dovecote garden, nest boxes, birdtables, sparrow nest box, birdtable, home & garden uk, pigeon cote, home and garden sale, pigeon houses, wren houses, brid houses, home designs for sale, cottage plans for sale, Dovecote, bird houses, dovecotes, the dovecote, dove cote, dovecote for sale, dovecotes for sale, dovecote plans, bird houses for sale, dove cot, how to make a dovecote, dove cotes, dovecote long ashton, dove coat, how to build a dovecote, dovecote cottage, bespoke bird tables, dovecots, marks dovecotes, the bird table, dovecotes for sale uk, dove cots, garden doves, dovecotes uk, wall mounted dovecote, pigeon cote, homing doves, 4 diy dovecote designs, bird table ideas, dove cote for sale, dove cote plans, the dove cote, dovecote bird houses, bespoke bird table, dovecote designs, dove cott, build a dovecote, unique bird tables, dove coats, keeping doves in a dovecote, making a dovecote, detached semi detached, bird baths and feeders, uk doves, how to make a dove cote, dove cote Bristol, dove cote park, dove cote farm, dovecote bird table, handmade bird table, buy dovecote, garden dovecotes, dovecote uk, house for doves, wooden dovecote, garden dove, bird table tops only, build your own dovecote, dove feeders, house for pigeons, dove bird houses, the dog kennel, dove cote designs, the dove cote Barossa, cote dove, dovecote birddovecote amazon, building a dovecote, making a dovecote, making a dovecote plans, inside a dovecote, build a dovecote plans, buying a dovecote, keeping a dovecote, constructing a dovecote, siting a dovecote, erecting a dovecote, dovecote barns york, dovecote bristol, dovecote bakery, dovecote bruton, dovecote barns purfleet, dovecote bakery cambridge, dovecote business park, dovecote buttery geddington, dovecote business park sale, dovecote ebay uk, , bespoke dovecote, bespoke wooden dovecote, doocote, doocotes, dove cotes, savilles dovecotes, savilles dove cotes, unique dovecotes, unique dove cotes, unique wooden dovecotes, unique wooden dove cotes, dovecote with slate roof, dovecote with wooden roof, dove cote with slate roof, dove cote with wooden roof, unusual dovecote. 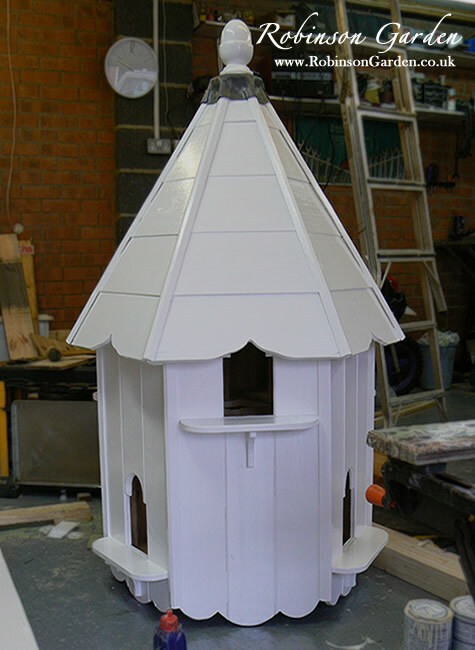 All of our Dovecotes come either ground fixed or free standing allowing you to choose if you would like your Dovecote fixed in a particular location or have it Freestanding so it can be moved. 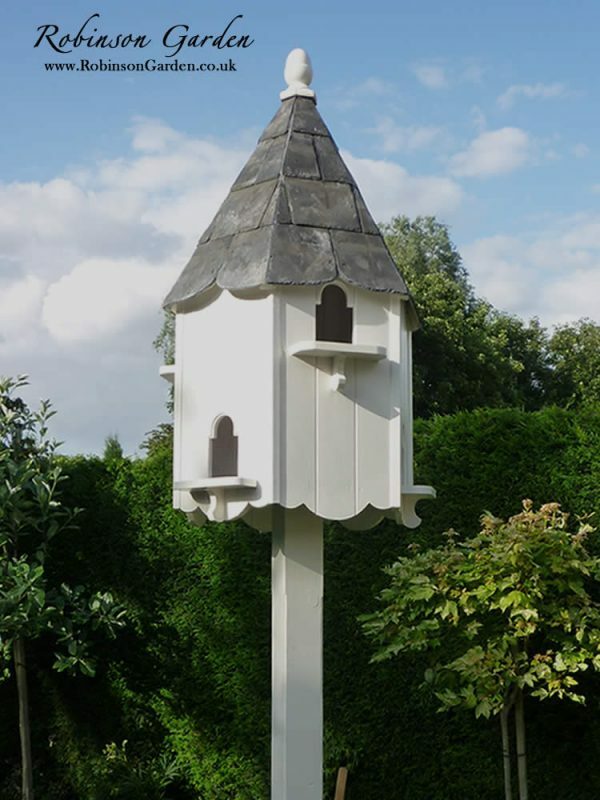 The Freestanding Dovecote allows you to be able to move the Dovecote wherever you wish. We would recommend that it should be moved by at least two people. We do advice that you secure it down in case of adverse weather conditions. 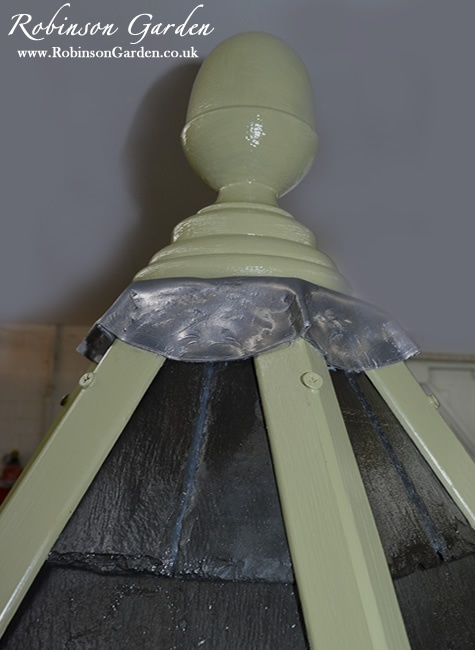 Robinson Garden is unable to fit Ground fixed Dovecotes due to insurance purposes, ensure you follow the fitting guidance in our Dovecote Guide. Check that the location of where you would like the Dovecote to be ground fixed is suitable for digging into the ground as on average you need a depth of around 3ft to securely fix the Dovecote into the ground. There are numerous fitting methods and they are all explained in the Dovecote guide. Freestanding height will vary slightly due the dovecote not being fixed into the ground.